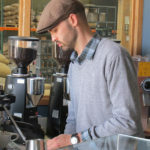 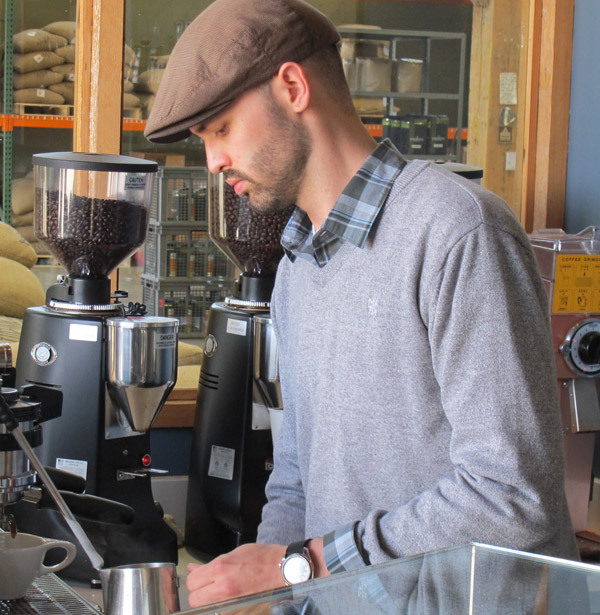 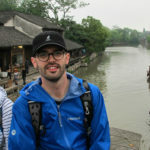 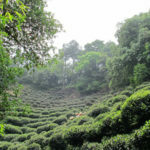 Tea Lands of China follows two Americans, Mark Rozell, a retail manager at Verve Coffee Roasters in Santa Cruz, CA and Victoria (Tori) Boyert, owner of Satori Tea Company in San Jose, CA, as they travel to two major tea regions in China to learn about two different types of Chinese tea. 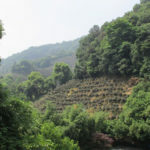 Longjing tea a.k.a. 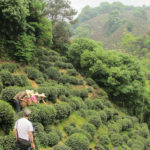 Dragon well tea (green tea) is grown in Hangzhou City in eastern China while Pu’er tea is grown in the southwest Yunnan Province near the border of Burma (Myanmar), Laos, and Vietnam. 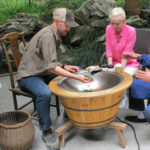 Mark and Tori learn how to pluck, process, and brew a perfect cup of Longjing tea at tea farms in Hangzhou City. 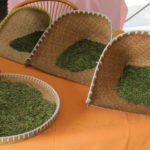 They also get a chance to eat popular dishes made with Longjing tea. 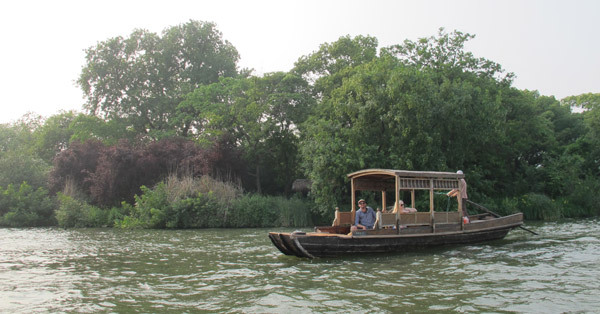 During their stay in Hangzhou they visit what is called “heaven on earth”, the famous West Lake, a UNESCO World Heritage Site, which encompasses beautiful nature scenes and pagodas along the cityscape. 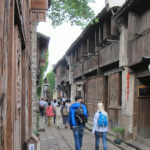 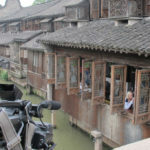 They also make an excursion to a 2000-year-old water town, Wuhzhen (north of Hangzhou). 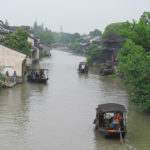 Some call it the “Venice” of China. 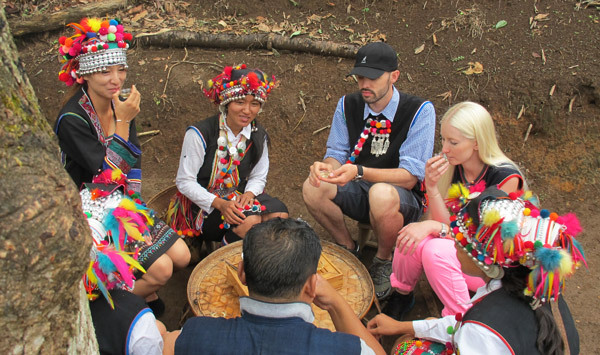 In Yunnan Province, Mark and Tori meet many different minority groups who introduce them to Pu’er tea. 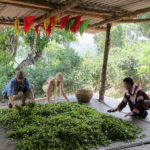 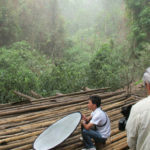 They climb 9 feet tall Pu’er tea trees to pluck their leaves, learn how the tea is processed, and drink a cup of the tea with Lahu and Bulang minorities. 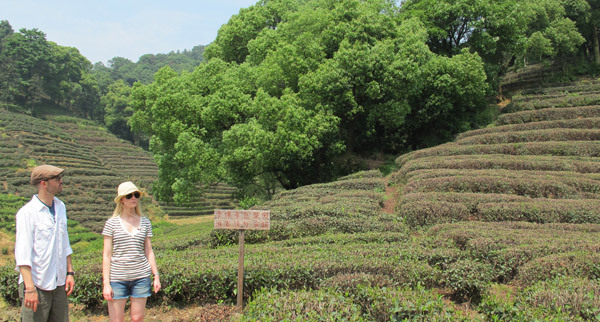 At a Hani minority village, Tori becomes emotionally moved as she stands in front of tea tree that is almost 900 years old. 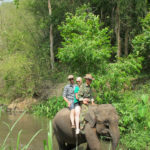 Mark and Tori also experience Wa minority drum dancing and elephant riding in the jungle. 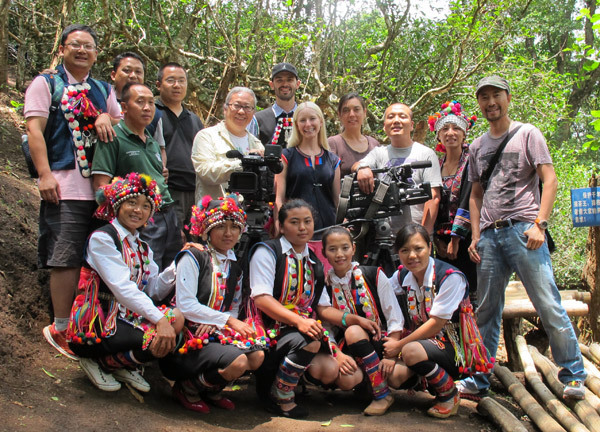 Stay tuned for this amazing journey, coming to you soon! 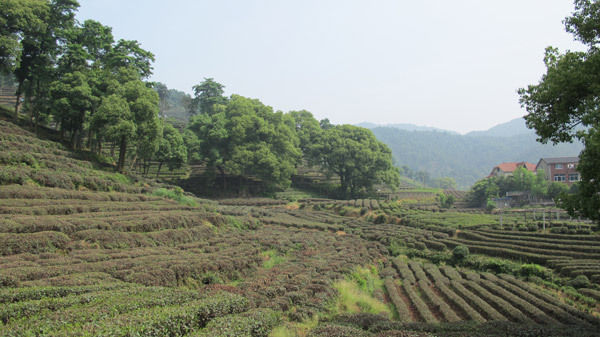 Magnificent view of Longjing Tea Farm. 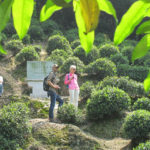 Enjoy the view of Longjing Tea Farm. 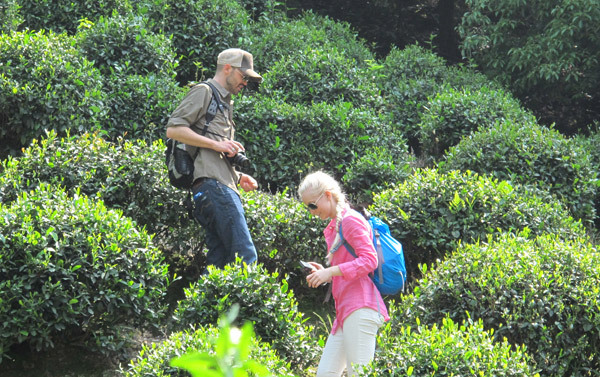 Mark and Tori are looking for the best Longjing tea leaves to pluck. 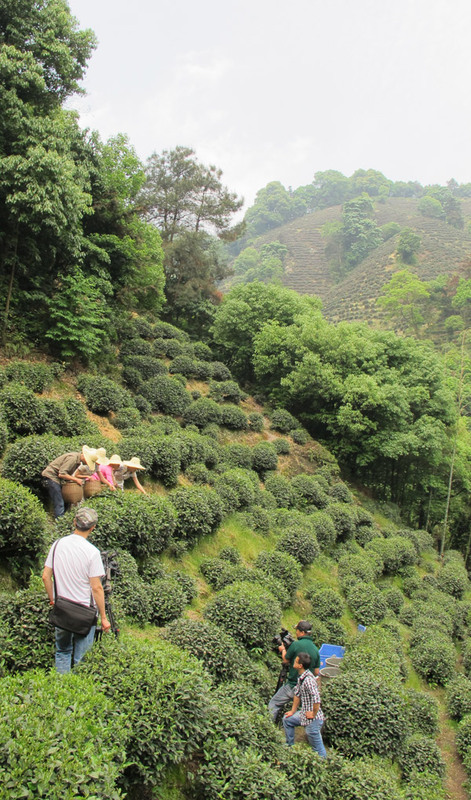 Plucking Longjing tea with two helpers. 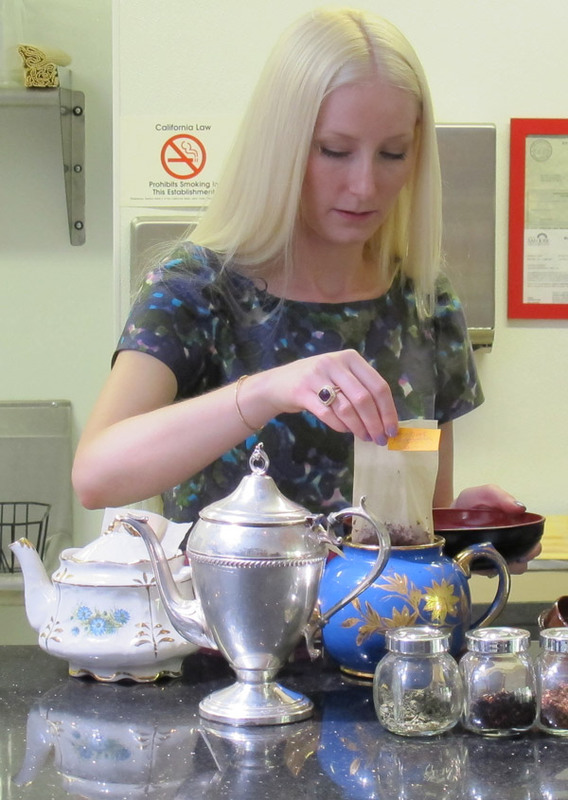 Two cameras are rolling while they plucking the tea. 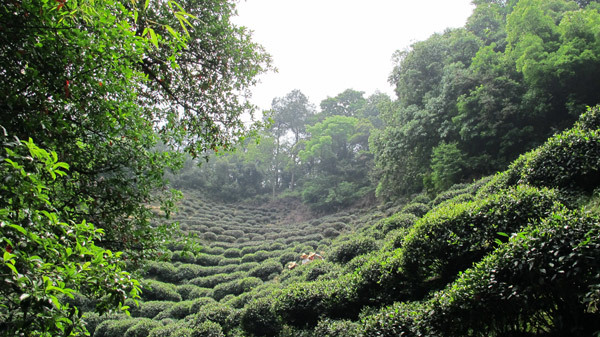 Beautiful view of Longjing (Dragon well) Tea Farm in Hangzhou, Zhejiang province. 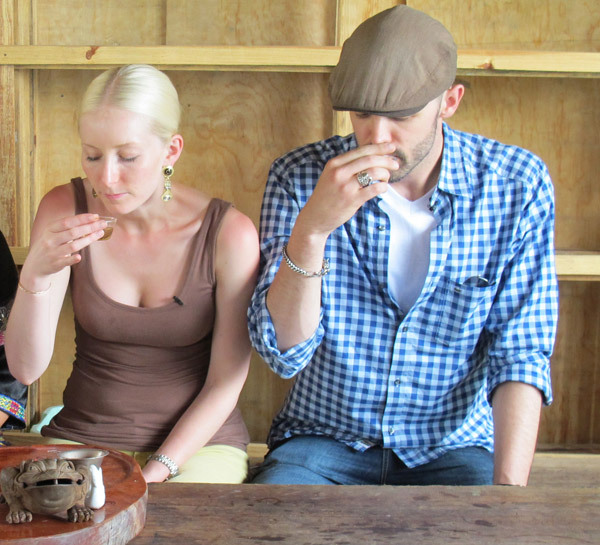 Mark and tori can’t stop plucking the tea. 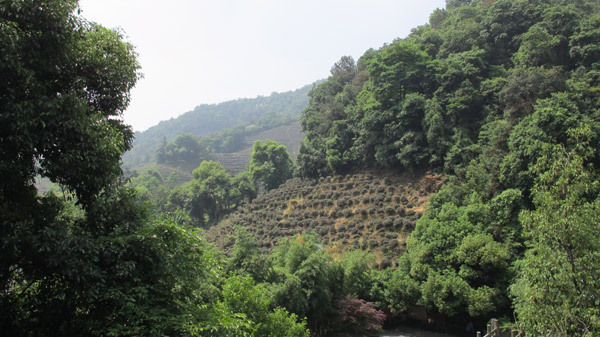 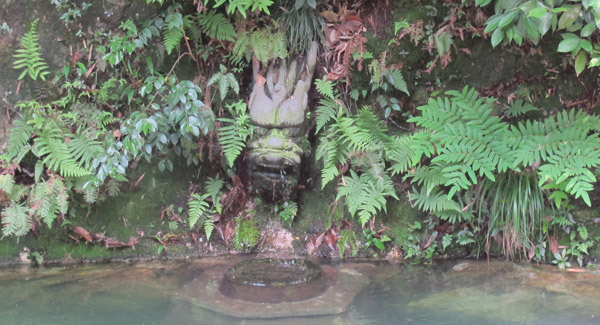 The Famous Dragon Well (Longjing). 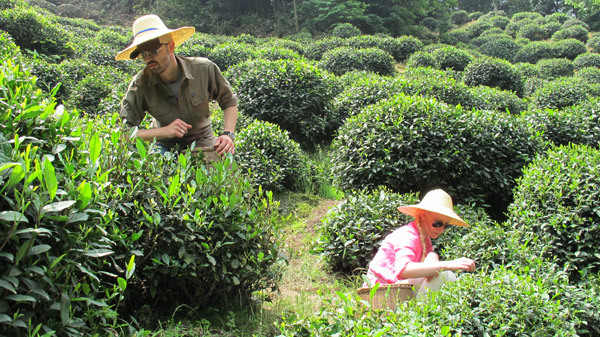 Mark and tori watch master making Longjing tea. 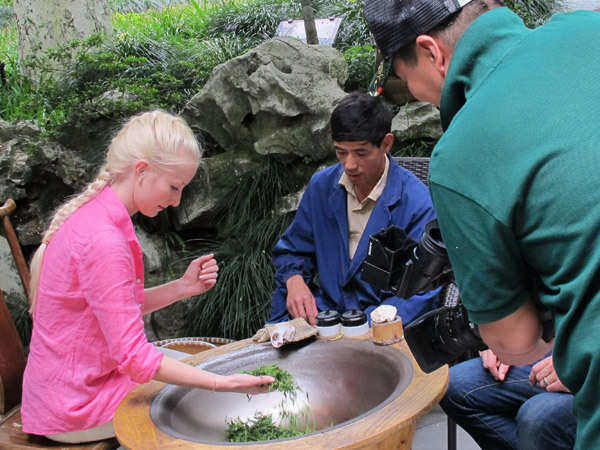 Tori is learning how to make Longjing tea. 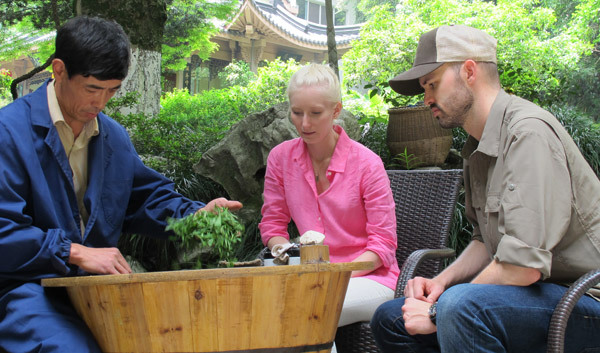 Mark is learning how to make Longjing tea. 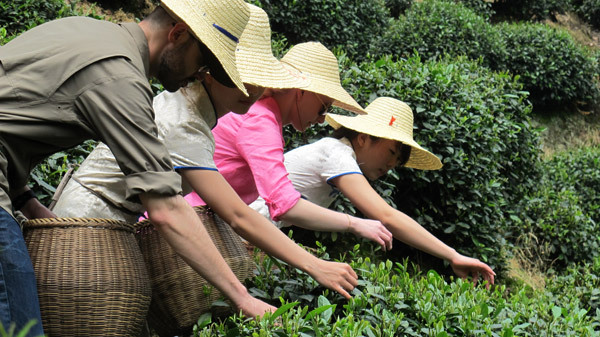 Freshest Longjing tea is done! 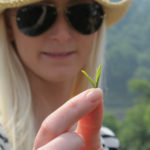 Amazing food at Longjing tea farm! 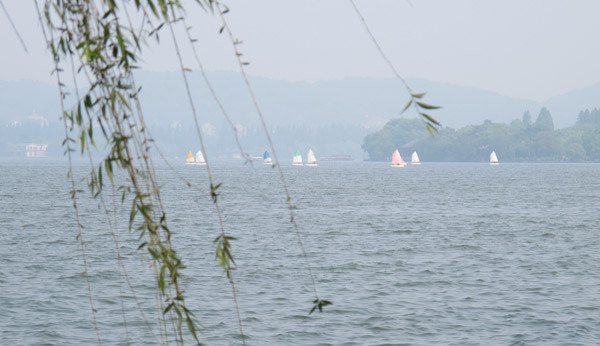 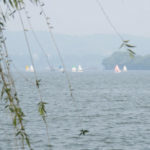 Beautiful West Lake in Hangzhou. 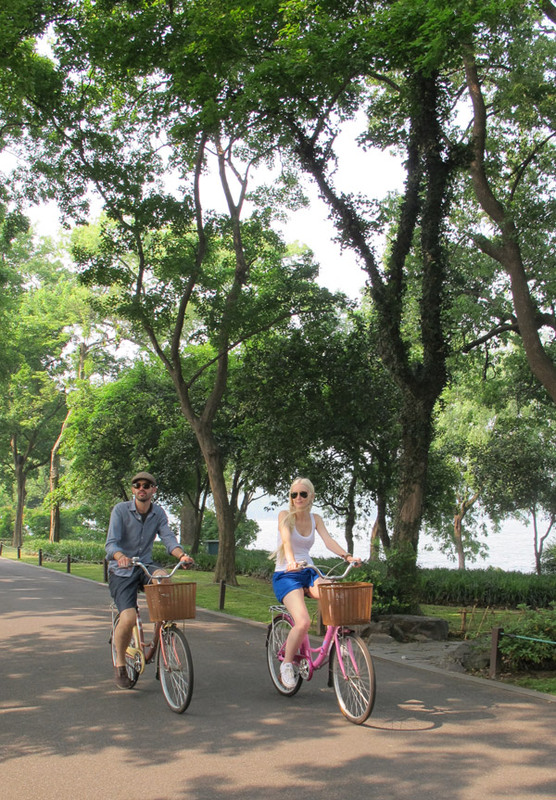 Mark and Tori are riding bikes along the West Lake. 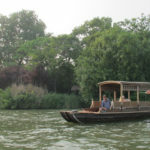 Mark and Tori enjoy the boat ride in the West Lake. 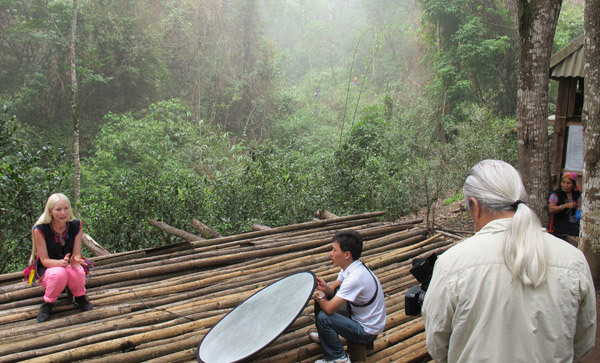 Beautiful view and beautiful people. 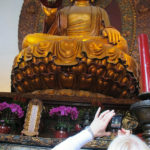 Heaven is very close to you! 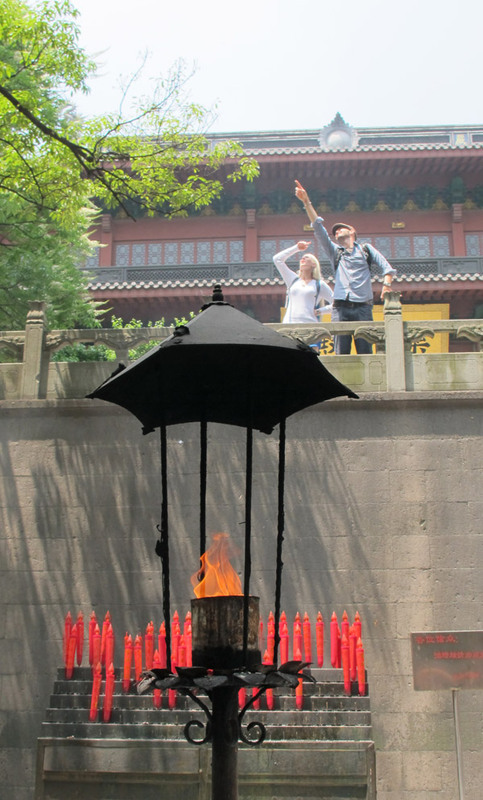 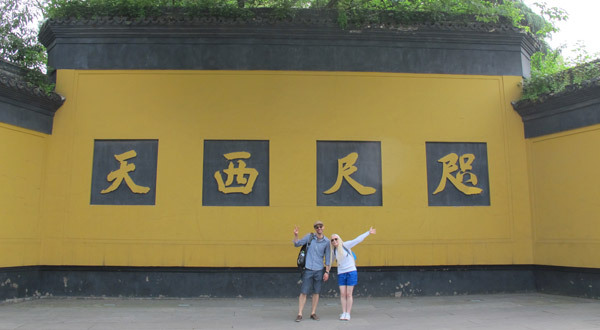 Mark and Tori are in Lingyin Temple in Hangzhou. 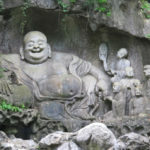 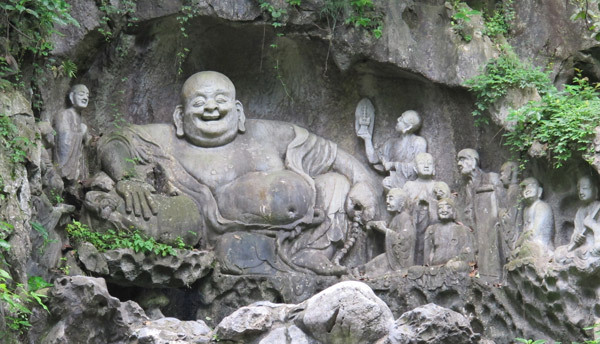 800 year-old stone sculpture of Mile Buddha (Buddha of the future). 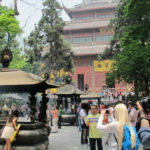 Lingyin Temple is always packed. 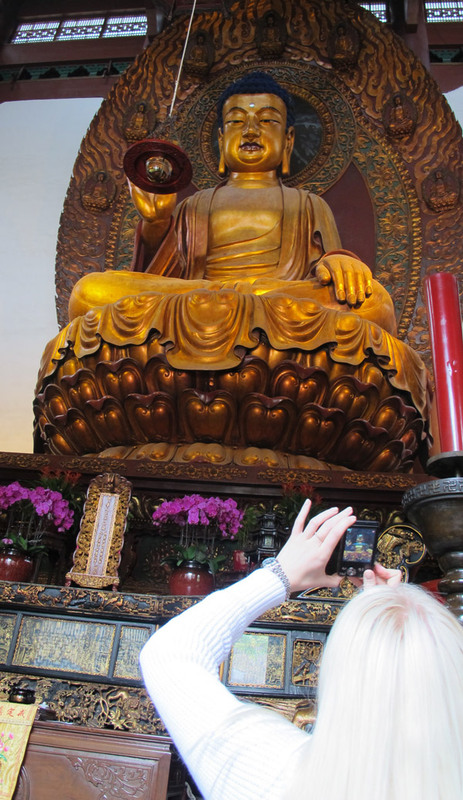 Tori is taking Shakyamuni Buddha home. 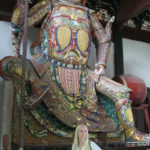 Tori is protected by one of the Heavenly Gods. 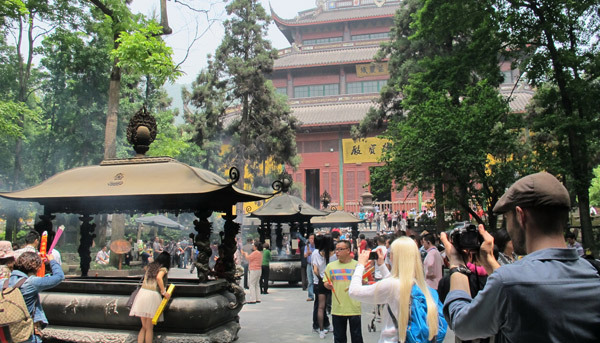 Mark and tori are admiring the beauty of Lingyin Temple. 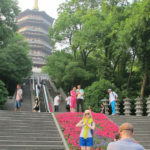 A memorable day ends in front of Leifeng Pagoda. 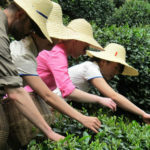 Tori plucks the best tea leave in Meijiawu Tea Farm. 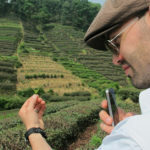 Mark is taking the tea leave home by phone in Meijiawu. 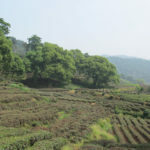 Beautiful view of Meijiawu Tea Farm. 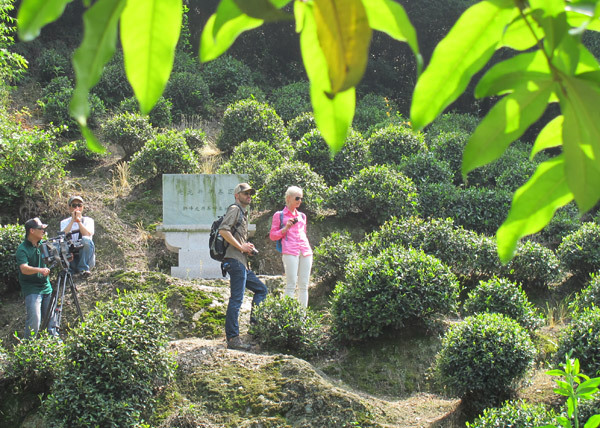 Mark and Tori enjoy the view in Meijiawu Tea Farm. 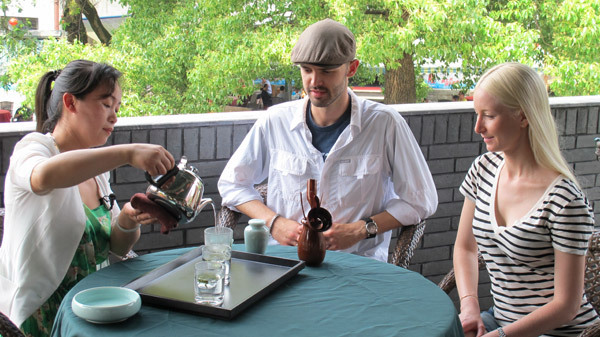 Mark and Tori are observing the Longjing Tea Ceremony. 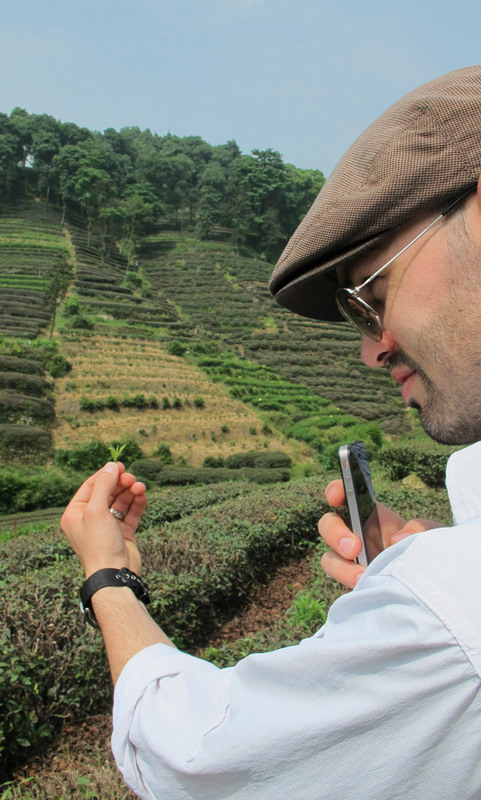 First sip of the best Longjing (Dragon well) tea in Meijiawu. 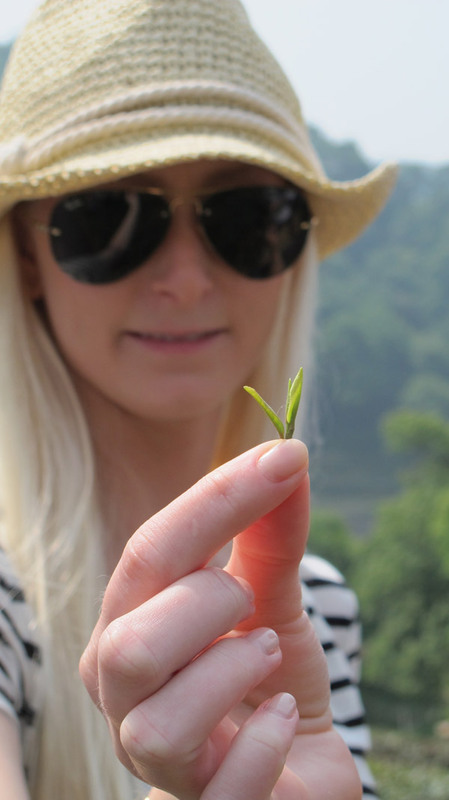 Different grades of Longjing tea. 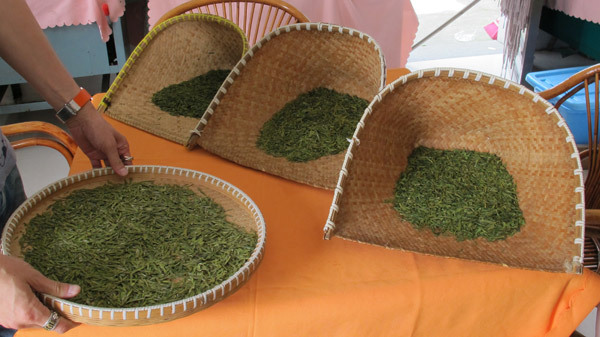 The round basket is the best grade. 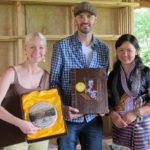 Two very happy people with their trophy. 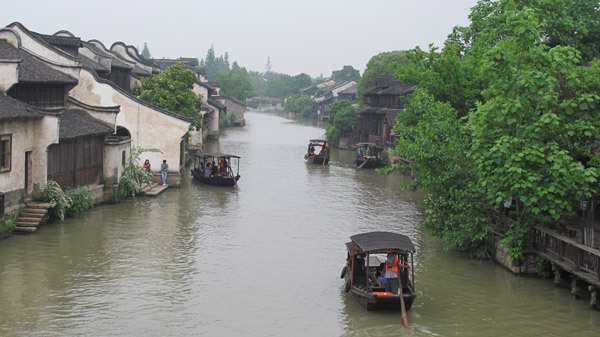 Beautiful Watertown -Wuzhen in Zhejiang Province. 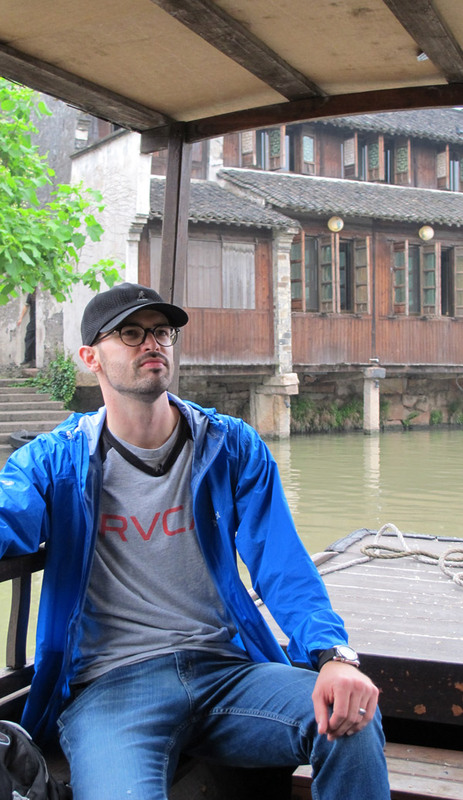 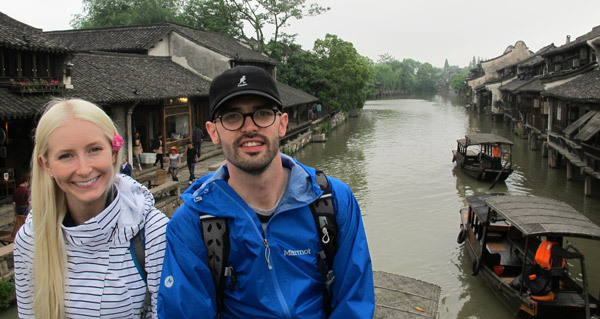 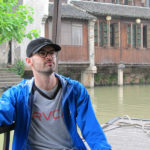 Mark is enjoying the view of Wuzhen in deep thought. 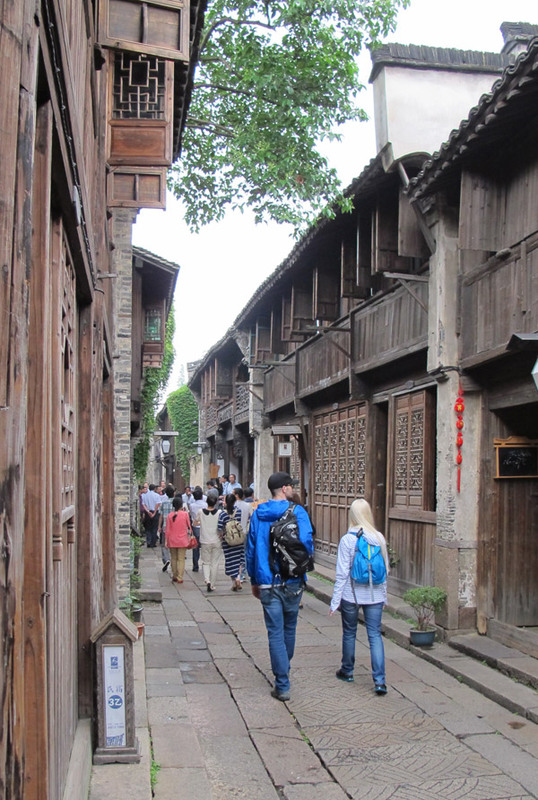 Mark and Tori walk in the small alley of Wuzhen. 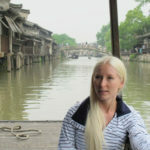 Tori is enjoying the view of Wuzhen on the water taxi. 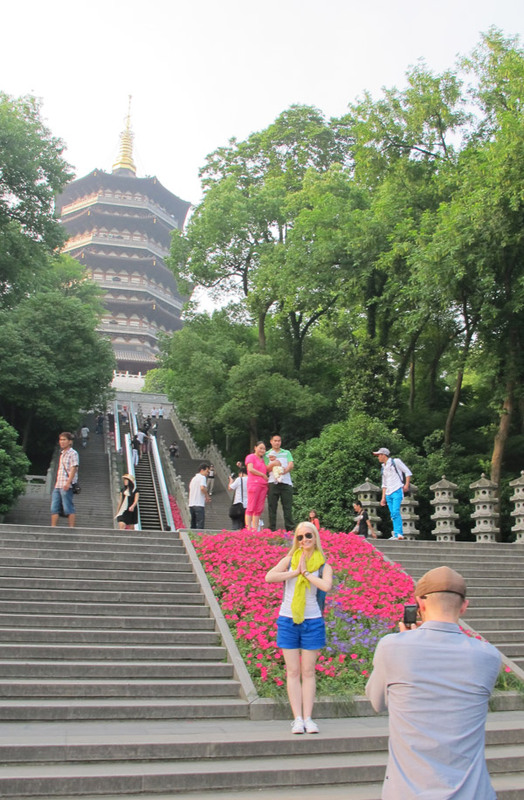 Cameraman Xiangdong is taking a great shot of Mark and Tori. 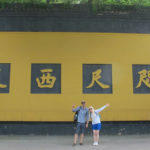 Mark and Tori are enjoying the chrysanthemum tea in a teahouse in Wuzhen. 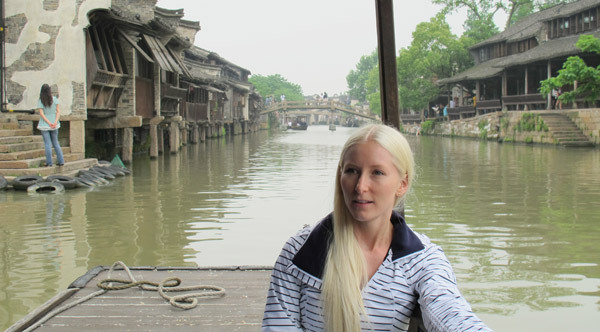 Sitting on the stone bridge of Wuzhen. 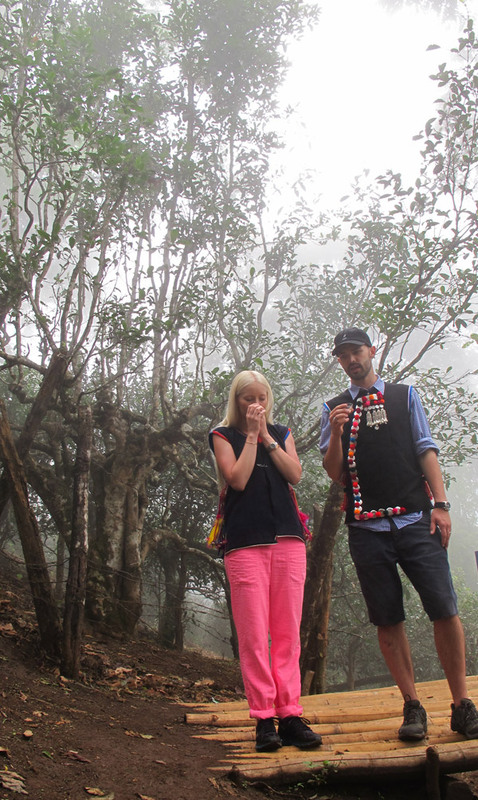 Mark and Tori are standing by a 600 year-old Pu’er tea tree in Hekai village, Yunnan Province. 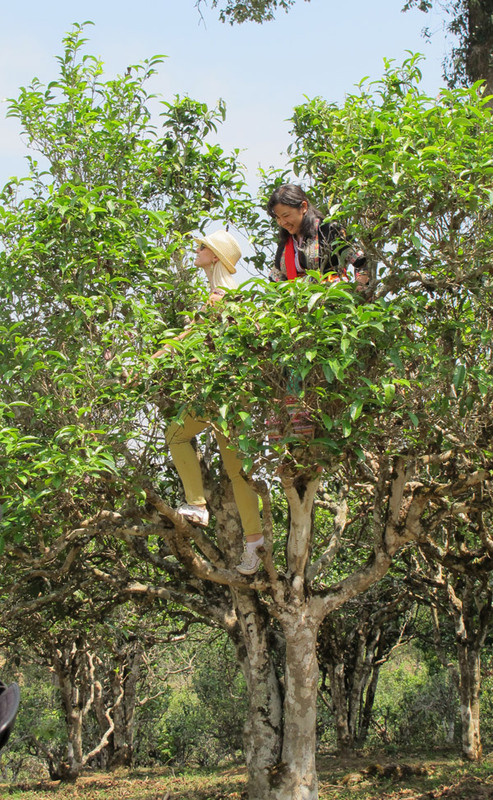 Local minority girls are climbing up the tree and plucking the Pu’er tea leaves. 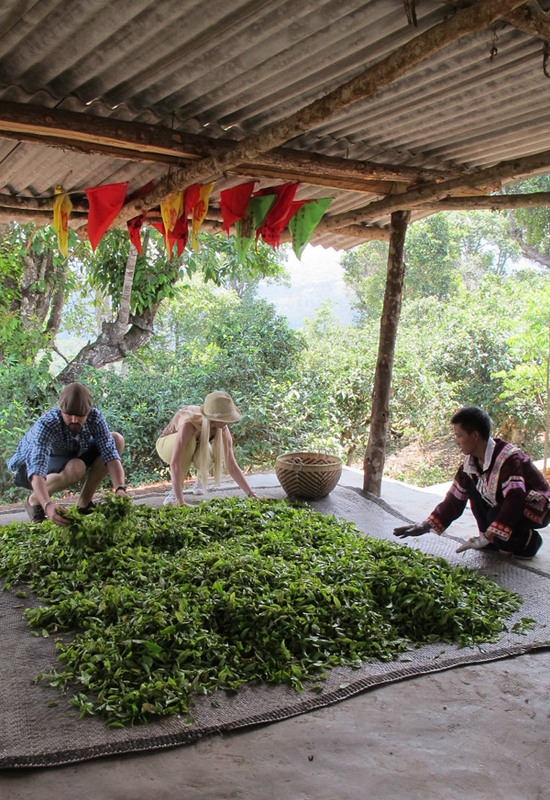 Tori is on the tree plucking Pu’er tea leaves. 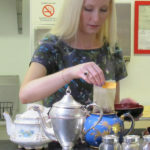 Tori is like a happy kid in the candy store. 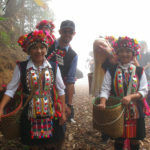 Tori is helped by Lahu minority lady plucking the Pu’er tea. 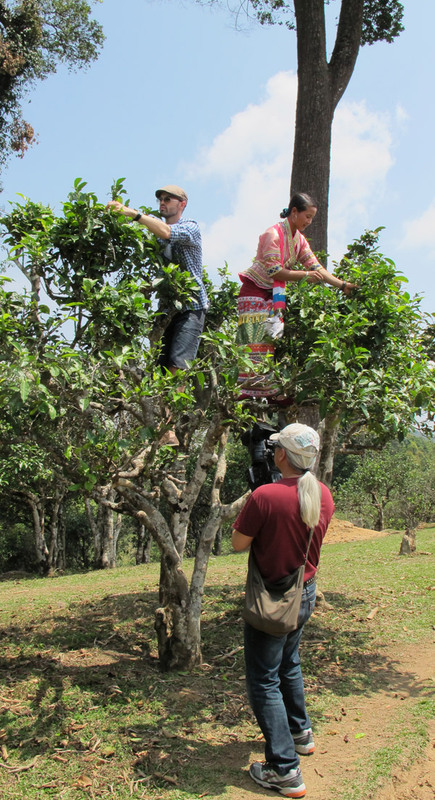 Mark is on the tree plucking Pu’er tea leaves. 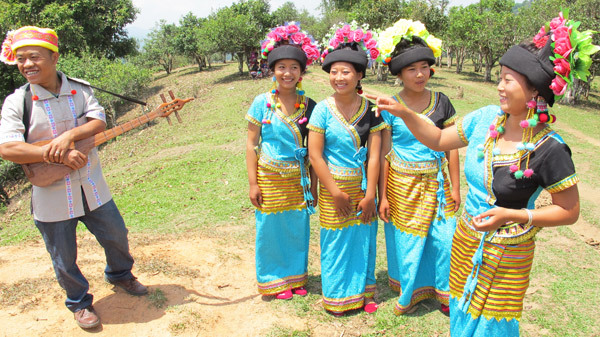 Bulang minority boy and girls can sing and pluck Pu’er tea. 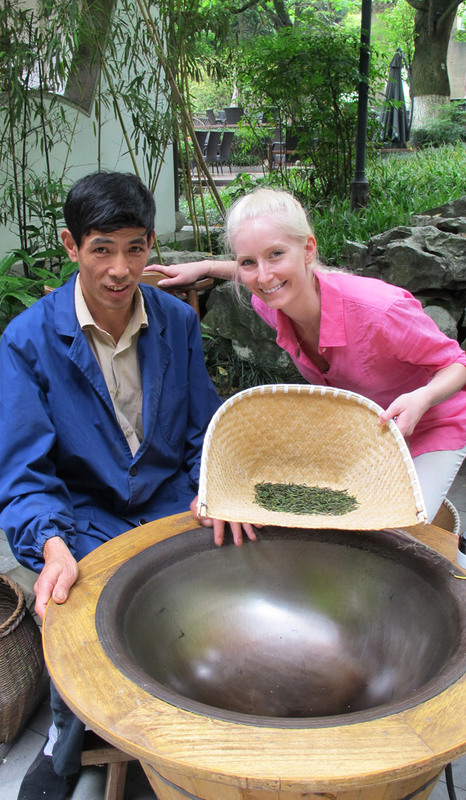 Mark and Tori are helping weathering Pu’er tea leaves. 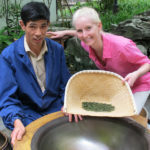 Mark and Tori are watching Lahu boy making Pu’er tea. 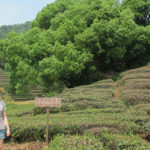 Tori is trying to make Pu’er tea. 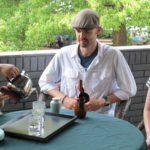 Mark’s turn to make Pu’er tea. 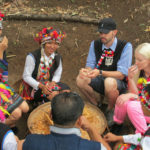 Mark and Tori enjoy local dishes. 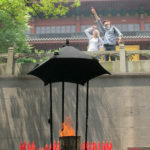 Mark and Tori are observing the Pu’er tea ceremony. 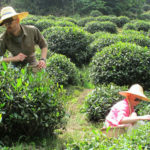 First sip of fresh raw Pu’er tea. 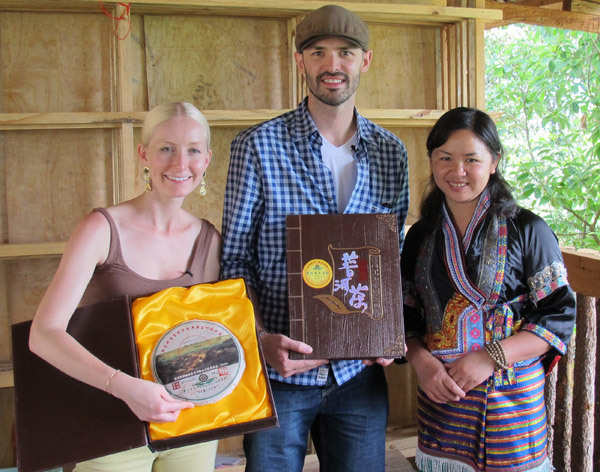 Lahu lady gives Bing Cha Pu’er tea to Mark and Tori as gifts. 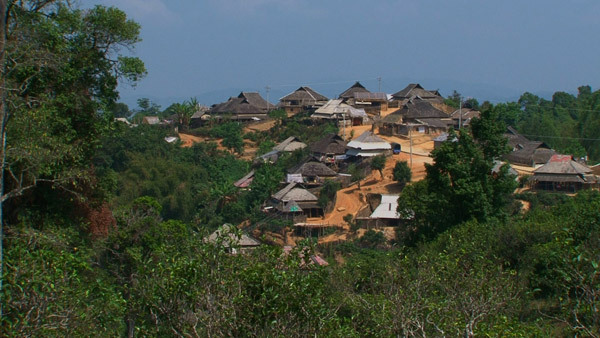 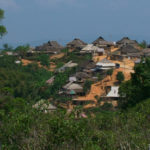 Amazing view of Hekai village in Yunnan province. 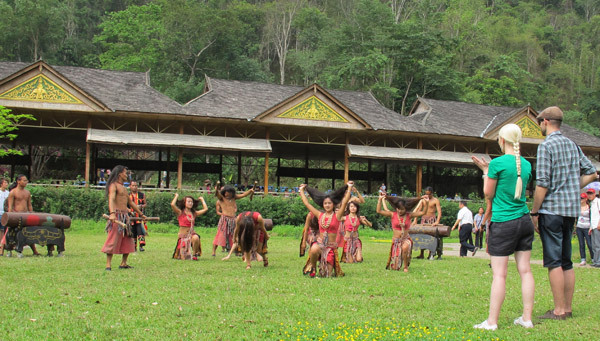 Mark and Tori are enjoying the Drum dance by Wa minority in Wild Elephant Valley. 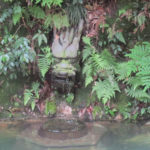 Tori is “Kidnapped” by warriors from the Wa minority. 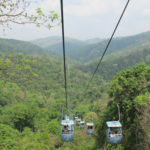 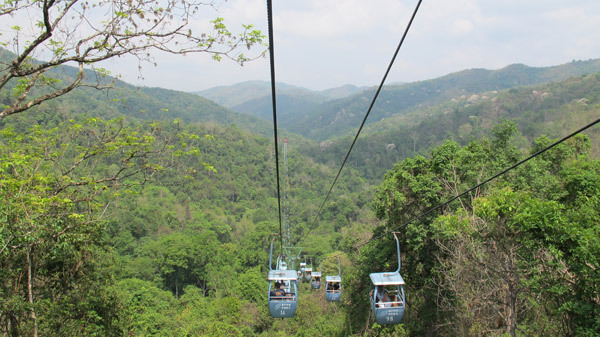 Cable car ride in the jungle of Yunnan. 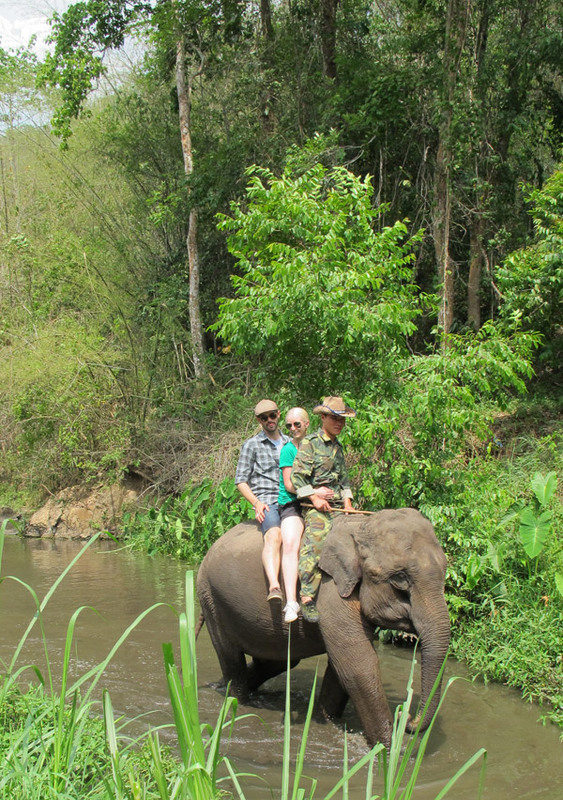 Mark and Tori are riding the elephant for the first time. 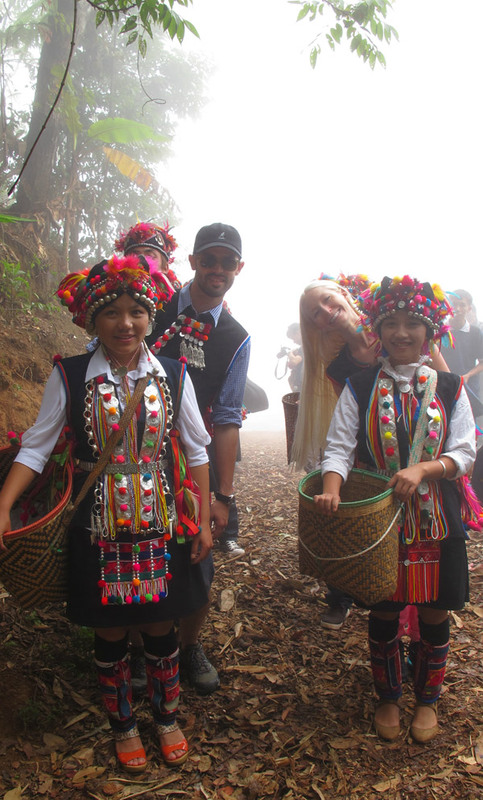 Mark and Tori are welcomed by Hani minority in Banpo Laozhai (Mid-mountain Old Village) Yunnan province. 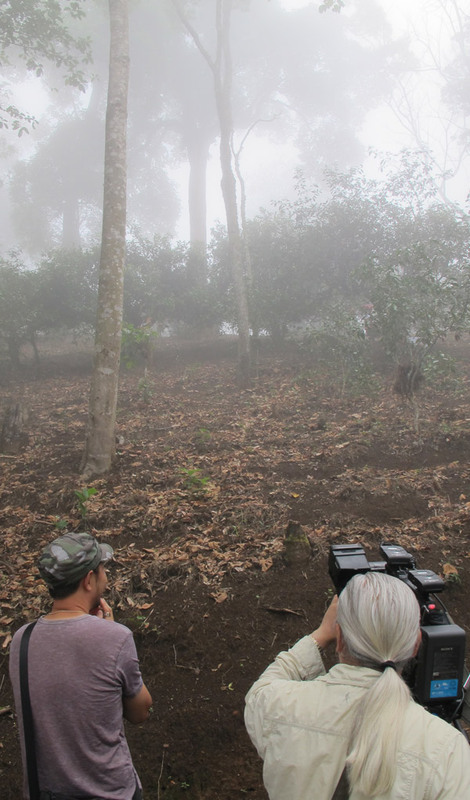 Shooting in the mist!! 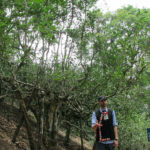 Did you see anything on the tree? 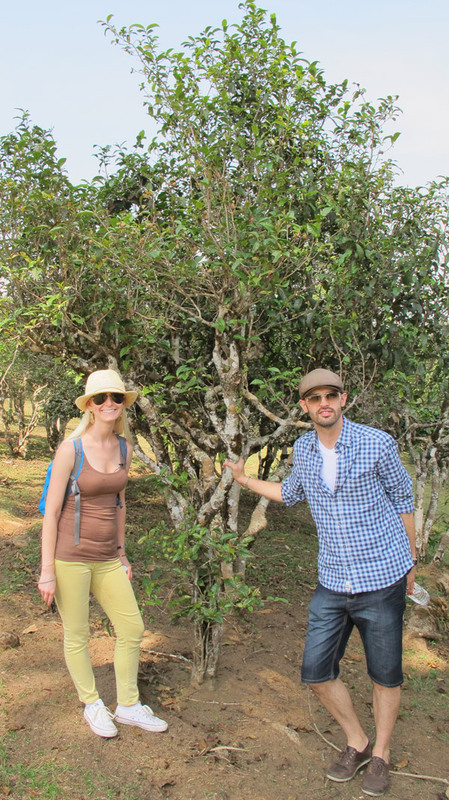 Mark and Tori are enjoying Pu’er tea in front of 800 year-old Pu’er tree. 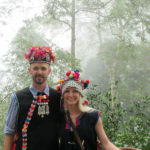 Mark and Tori are dressed in Hani minority dress in the Pu’er tea farm. 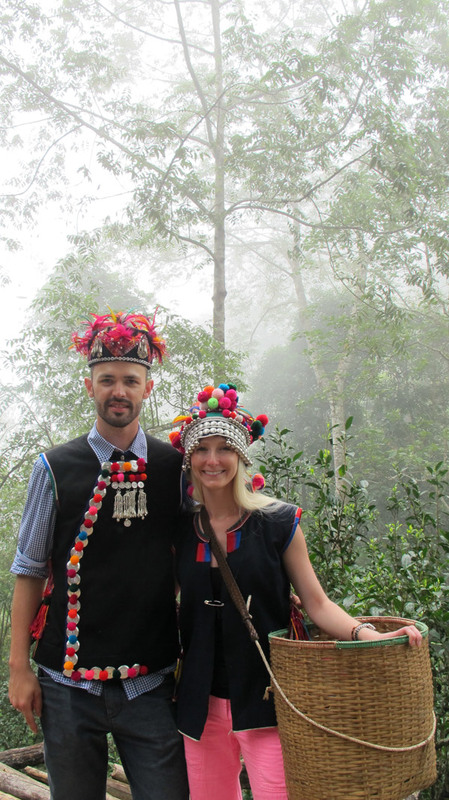 Mark and Tori are enjoying Pu’er tea which are made from 800 year-old Pu’er tea tree. 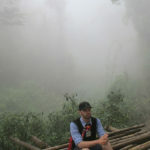 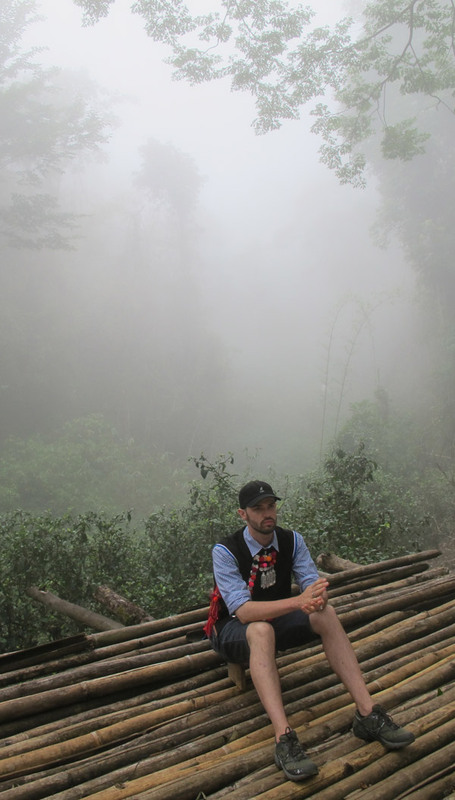 Mark is interviewed in the mist. 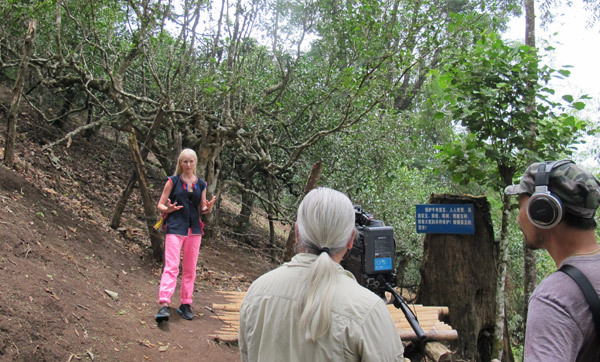 Tori is interviewed in a very beautiful natural setting. 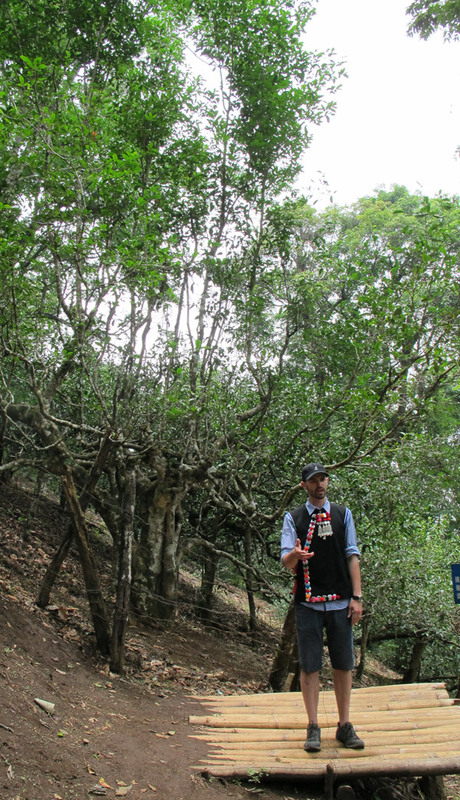 Mark is in front of the 800 year-old Pu’er tree doing the final interview. 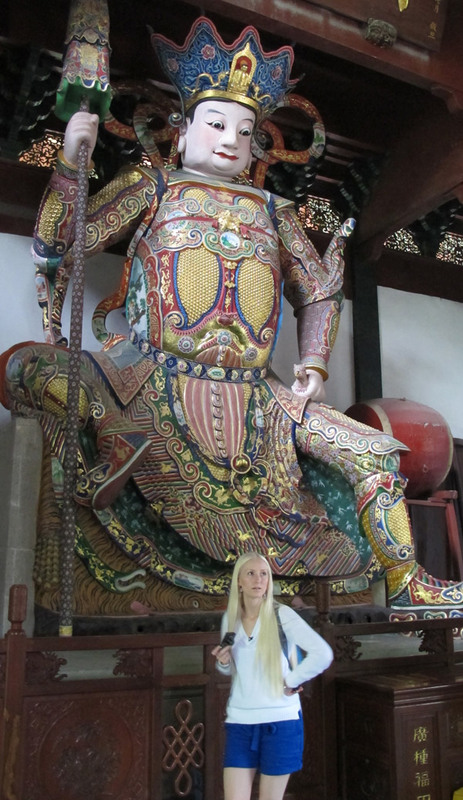 Tori is in front of the 800 year-old Pu’er tree doing the final interview. 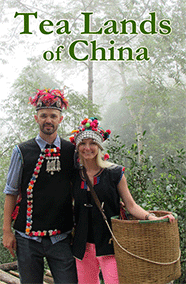 To request Tea Lands of China contact the TV Programmer at your local PBS station.